The paper provides an overview of the range of activities undertaken by European NGOs and the informal sector before and since the European sub-regional preparatory meeting, in Nitra, for the International Conference and Programme on Plant Genetic Resources and the subsequent Leipzig Technical Conference. In particular, examples are provided of work on the conservation and sustainable use of PGRFA, as well as on related research, advocacy and public information and concludes that there has been a significant increase in activity in the past two years. 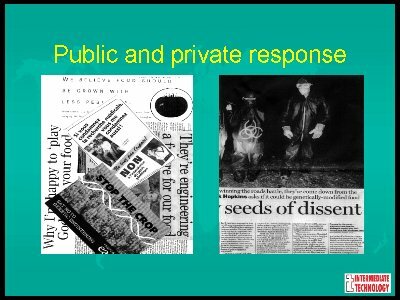 These examples have been taken from informal surveys and other information and include the development of seed banks and exchange schemes; research and development of new varieties for niche markets and ways of maintaining existing PGRFA options; advocacy on conservation and sustainable use, seed laws, rights and intellectual property; and use of a wide range of media for awareness raising and communication. Notwithstanding this increase, the paper presents an NGO view of some of the (potentially decisive) obstacles to effective work on the sustainable use of PGRFA, particularly because of public and private sector R&D processes, their control, direction and output (quality and ownership), and proposes ways of overcoming these. The opportunities and constraints for further work by the informal sector across the whole of Europe are then assessed and an agenda is presented, which could be developed in conjunction with the formal (public) sector. NGOs and other actors from the informal sector, broadly representative of Civil Society, are key players in maintaining and developing diversity in the gardens and farms of Europe. European Non-Governmental Organisations (NGOs) have been increasingly active in work on Plant Genetic Resources for Food and Agriculture (PGRFA) issues and are networking more than ever in order to ensure the sustainable use of PGRFA in Europe and in the poorer majority world of the South. This is work that could be enhanced through synergistic collaboration with the formal sector. This paper reviews what European NGOs have done both before and after the European sub-regional preparatory meeting in Nitra for the International Conference and Programme on Plant Genetic Resources and the subsequent Leipzig Technical Conference at which the Global Plan of Action on the Conservation and Sustainable Utilisation of Plant Genetic Resources for Food and Agriculture (GPA) and the Leipzig Declaration2 were adopted. The paper presents examples of the increased work being carried out by NGOs and the informal sector on the conservation and sustainable use of PGRFA, as well as on related research, advocacy and public information. It uses information derived from an informal NGO survey and elsewhere. It also assesses the opportunities and constraints for further work by the informal sector across Europe and presents an agenda, which could be developed in conjunction with the formal sector. The positive steps taken by the European Cooperative Programme of Genetic Resources Networks (ECP/GR) in Nitra and subsequently by governments in Leipzig laid the ground for improved collaboration between the formal and informal sectors. A number of areas have been identified in which the formal sector will need to work more actively with the informal sector in order to ensure fulfilling national commitments to the Leipzig GPA and the Conference of the Parties (COP) to the Convention on Biological Diversity's (CBD) Decisions III/11 and IV/6. Additionally, but outside the scope of this paper, the opportunities for improved liaison between NGOs and national delegations should be explored in order to hasten a satisfactory conclusion to the negotiations by the Commission on Genetic Resources for Food and Agriculture (CGRFA) of the Food and Agriculture Organisation of the United Nations (FAO) on the Revision of the International Undertaking on Plant Genetic Resources (IU) in harmony with the CBD and its adoption as a Protocol to the CBD. When this comes into force, the IU/Protocol will govern access and benefit sharing agreements concerning genetic resources for food and agriculture and will make Farmers' Rights legally binding. NGOs regard governments' attitudes and commitment to reaching a satisfactory conclusion to these negotiations as indicative of their overall concern for the conservation and sustainable utilisation of genetic resources and their recognition of the contribution of farmers over the millennia to developing and safeguarding these resources. It is a litmus test of their seriousness in wanting to collaborate with the informal sector. This collaboration is important, but it is being developed in a context where the basis of work on PGRFA is being undermined by the rapid and relatively unchecked spread of inappropriate technologies (and the Intellectual Property Rights (IPR) systems that support them) which are reducing diversity and choice. 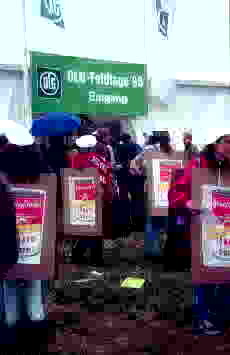 These developments further undermine opportunities for collaboration unless the formal sector is willing to be very clear in its defence of diversity and to use its powers to put a moratorium on the use of such technologies and the release of Genetically Modified Organisms (GMOs) or Living Modified Organisms (LMOs). Based on positions taken in the Biosafety Protocol and other CBD, FAO and WTO negotiations it would seem that European governments are generally weak in this area. For nearly two decades there has been active involvement in PGRFA issues by NGOs at a European level. The pioneering efforts of the Seeds Action Network, lead by ICDA then GRAIN argued successfully for an EC commitment to an agricultural biodiversity programme that would address concerns of all actors in Europe (1467/94) and helped push for PGRFA measures to be included in 2078/92. (NGOs have doubts about the effectiveness of these measures and would hope the ECP/GR will evaluate them). 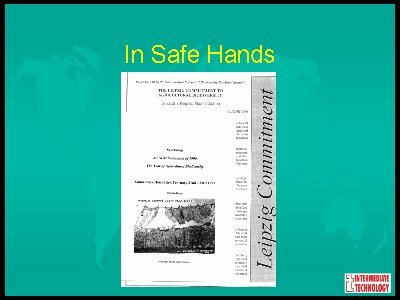 There was significant collaboration in the 1993 Gatersleben Symposium which gave increased recognition and impetus to in situ conservation by the informal sector in Europe. This symposium was organised by ECP/GR members with the support of the British Council. The meeting in Nitra in 1995 was a step forward in its inclusivity of NGOs and the willingness of ECP/GR to work more closely with NGOs. It was recognised that NGOs had a special role to play and that their collaboration in programmes for on-farm conservation was essential to their success. The meeting recommended that both the formal and informal sectors should work towards improving the benefits of collaboration and that the formal sector identify the needs of, and opportunities for working with, NGOs and develop concrete actions, particularly in the areas of training, access, coordination, information, public awareness and assessing legal constraints to collaboration. (b) that the needs of, and opportunities for working with, NGOs be properly identified, and concrete actions be developed, particularly in the areas of training, access to reproductive material, national coordination, information, public awareness and assessing legal constraints to collaboration. The Nitra meeting was preparatory to the historic Leipzig conference in which European NGOs participated fully, ably lead by BUKO Agrar Koordination. The NGOs' pre-meeting 'In Safe Hands: communities safeguard agricultural biodiversity' concluded with the 'Leipzig Commitment to Agricultural Biodiversity' - some 24 specific commitments to the conservation and sustainable use of PGRFA and the full recognition and implementation of Farmers' Rights. (A report of the meeting 'In Safe Hands: communities safeguard agricultural biodiversity' is available from BUKO - price DM10 & p+p). The Braunschweig PGRFA symposium is an opportunity for the ECP/GR to review what has happened since Leipzig especially with regard to practical actions and informal sector relations. From an NGO perspective, there has been some progress, especially by the informal sector and some improvement in relations with the formal sector. Much of the information in this paper comes from an ongoing informal survey of organisations across Europe collected by BUKO with advice from SAVE (Safeguard Agricultural Varieties in Europe) and ITDG. The respondents, from about 30 organisations, came from nearly half of the European countries (more NGOs in the west and more parastatals in the east). NGOs come in many shapes and sizes, and with a wide variation of purposes and outputs. However, although they have specialisms, there is more that unites than divides them on these crucial issues. In many countries, NGOs and small private organisations provide unique access for the public to old, delisted and niche varieties, especially for organic growers. Through non-governmental organisations the public can borrow or purchase a diversity of seeds, bulk up varieties, source and exchange material and support the local ex situ conservation of varieties. It is invidious, perhaps, to highlight specific NGOs, but examples of excellent providers include, HDRA in the UK, Pro Specie Rara in Switzerland, Arche Noah in Austria and Irish Seed Savers which hosted the successful ECP/GR Malus meeting last year. NGOs keep diversity alive, growing in the gardens of enthusiasts across Europe. Many European NGOs support work in the developing world, for example a project that ITDG is carrying out with the Overseas Development Institute (ODI), supported by the UK government's Department for International Development (DFID) in Kenya, Zimbabwe and Peru, on in situ conservation of local varieties through maintaining farmers' PGRFA options. One mechanism is an Annual Seed Show / Seed Fair, where, on 6 March 1998, some 56 farmers from up to 5 hours walk away gathered at the Chief's camp to exhibit and celebrate the diversity of crops and varieties planted. 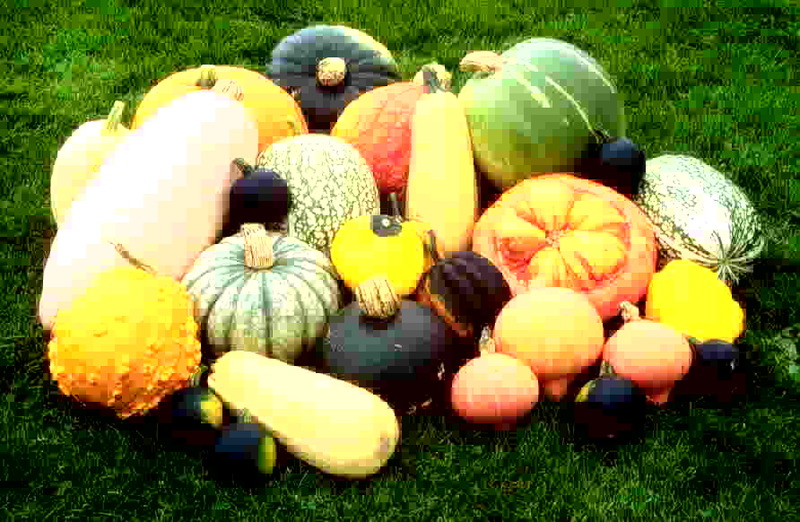 149 varieties of over a dozen crops were shown, the winning community, GAKIA, having more than 40 varieties on display. It was also an opportunity to discuss the qualities of seed as well as to exchange and sell seed. Interest in these Seed Shows is widespread and a representative of the National Gene Bank came to this seed show and discussed with the Chief the storage of local varieties in the National Collection, which, given proper recording, adequate safeguards, Prior Informed Consent, and an agreed Protocol, will provide added seed security to the community. Another example is some work that ITDG is doing with the Henry Doubleday Research Association (HDRA) and the UK Agricultural Biodiversity Coalition (Ukabc) in supporting a regional network, Participatory Ecological Land Use Management (PELUM), in southern and eastern Africa to improve seed security. And there are more examples including work done by NGOs in maintaining or restoring PGRFA in conflict situations. Most informal sector research is practical in its outcomes, based on thorough analysis. 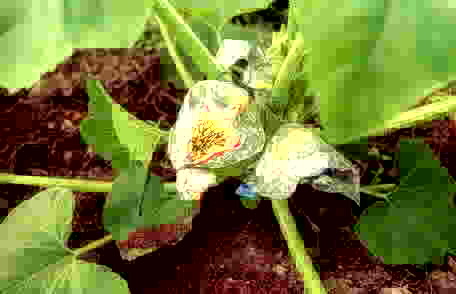 Notable, is the development of new varieties for niche markets and ecological niches, especially organic food production. This is the necessary direction for food production in Europe and is the least subsidised type of European agriculture, one that the informal sector dominates, by default. NGOs have developed methods for conservation in situ and ex situ, sustainable utilisation, and multiplication of material in conjunction with the formal sector. NGOs have innovated in outreach methods using many media and techniques to ensure. NGOs also research ways of identifying, recruiting and retaining reliable seed savers, especially from younger generations. In the area of advocacy, NGOs have greater freedom of expression than the formal sector. Through collaboration in this area, more than any other, synergy can best be realised. There is a lot of awareness by specialists of the main threats and opportunities for PGRFA conservation and sustainable use and the fair and equitable sharing of benefits from its enhanced use but this is not widely reflected in European government policy. The formal sector may be constrained from publicising these by national and political mandates and the relatively low priority of agriculture in the economy. NGOs are constrained by lack of resources. Both sectors, however, would wish to see a more diverse, sustainable agriculture with plurality of suppliers, producers and retailers. With greater awareness by policy makers, there might be changes in policy, which would help to ensure real variety and choice to consumers. A joint approach by both the informal and formal sectors could be effective. There are also important issues concerning the exploitation of people and their genetic and other agricultural resources both in Europe and other regions which need to be resolved through satisfactory conclusion of the negotiations on the International Undertaking (see above). Formal sector organisations are usually the principal advisers to governments and NGOs would wish that they would take a more vigorous position in advocating in favour of diversity and of a diverse food system, perhaps through the ECP/GR at the European level. NGOs are saddened that governments seem to ignore wise counsel and listen more to industry than the views of small producers and ordinary consumers, when developing Intellectual Property agreements (for example the European Patent Directive). This sends a poor signal to the rest of the world. NGOs also feel that there should also be very strict regulation of Genetic Engineering and enforcement of the Precautionary Principle with respect to deliberate releases of GMOs and LMOs, in order to protect future generations from some fantastic 'Mad Plant Disease'. This is something which governments appear reluctant to do. However, it is encouraging to note significant improvements in collaboration since Leipzig especially in the development of Seed Laws in Austria, France, Germany, Sweden, among others, which recognise the value of local heritage, delisted and niche (but not GM) varieties of seeds and allow their sale in limited quantities. One respondent to the NGO survey noted the need for freedom of choice without sacrificing consumer protection, which neatly summarises a commonly perceived priority - a loosely regulated market that excludes misinformation about seeds and also excludes genetically modified material. There has been a growth in awareness and action on issues relating to PGRFA since Leipzig. NGOs, the principal proponents of the positive messages, have used many media to achieve this. Industry is now pushing its messages, distorting realities in the main, although some retailers are taking a responsible attitude and are providing consumers with accurate objective information. The formal sector has been generally weak in this area, with some notable exceptions, and would perform a valuable public service by providing high quality information. "Freedom of choice without sacrificing consumer protection"
The celebration of Plant Diversity - the Braunschweig Seed Fair - held on Sunday 28 June 1998, not only informed the nearly 200 participants, but extended to a wide audience nationally. For example, a short article in a German national magazine resulted in nearly 1000 enquiries - and press interest in the Seed Fair was picked up by the local media yesterday in print, radio and TV media. The focus of the discussions was on the immense value of plant genetic diversity for food, agriculture and ecology and the increasing threat to this diversity from genetically manipulated seeds [including use of 'Terminator Technology']. NGOs are networking more effectively among themselves, e.g. through the UK agricultural biodiversity coalition (UKabc) as well as an emerging European Network. They are also extending their links to the formal sector, to the extent it is willing. But many formal sector institutions are ignoring some realities, particularly with respect to consumer perceptions. The public does not trust these scientific developments. They can see no direct consumer benefits in genetically modified seeds. 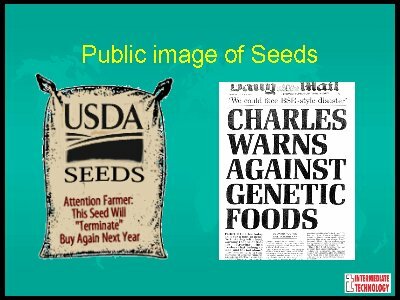 These technologically-driven changes in (often chemically compliant) GM seeds are perceived as being of no benefit, and possible harm, to farmers and consumers. The role of the PGRFA community should be to promote the sustainable use of the wealth of genetic resources already available to us not in creating and promoting what one eminent retailer in the UK has called 'Frankenstein Foods'. Industry's response has been to pump money into publicity campaigns (e.g. an estimated $22m on the Swiss referendum on the patenting of life forms, undisclosed sums on swaying MEPs in the European Patent Directive vote and in excess of £20m being spent by Monsanto on European publicity in summer 1998). NGOs' penniless response has been to use royalty to publicise the issues (for example a newspaper article by Prince Charles and follow-up press material). Some organisations have supported movements of ecowarriors that have taken direct action - a development that is not welcomed by researchers or industry, but which, however desirable, gains newspaper headlines. 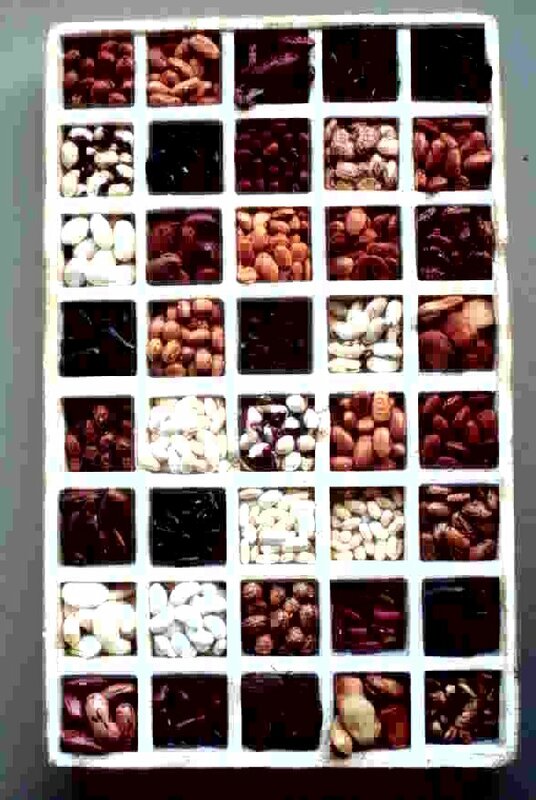 There should be greater use of the diversity that exists in inherently diverse farmers' varieties and mixtures of seeds, such as the mixture of 11 varieties of sorghum, millet, beans and gourds from Kenya, illustrated above. It contains all the diversity needed to withstand pests, irregular rains and increased human demands. 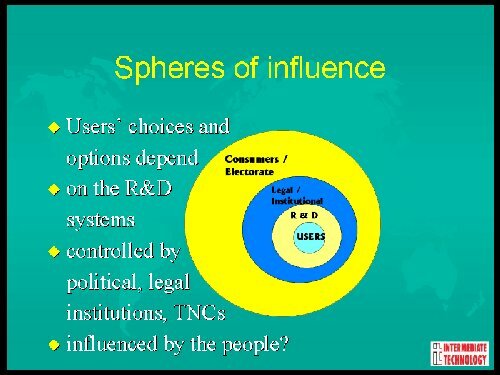 Spheres of Influence: PGRFA users' choices and options depend on the R&D systems controlled by political, legal institutions and TNCs. Are these influenced by the people? It is possible to influence the public and consumers - the electorate who ultimately should control the agenda and funding, who, in a democratic and plural society have the right to frame the institutions and legal systems that give the priorities for formal sector work. It is society's investment in public sector R&D (and regulation of private R&D) which determines the real choices for users of PGRFA - both producers and consumers. It is an enormous challenge to achieve this and it will require increase public support. increasingly monopolistic industry Public Relations and practices which are poisoning consumer choice. Overall, a major constraint is the resources that are needed - a perennial concern, which lowers effectiveness. In some areas of work costs have reduced. Electronic communications facilitate networking and exchange of information at relatively low cost. These advantages should be extended to every European country and would help with the development of emerging NGOs in the east and their inclusion in European networks. There are new opportunities being discussed in the corridor lobbies of FAO, CBD, WTO, EU, which could increase public and policy recognition and support for PGRFA, especially through practical and public information actions by NGOs. Formal sector support for these activities is essential. 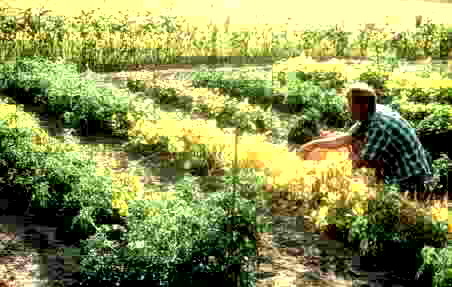 The Technologies used for developing and maintaining diversity, the Services provided and the Intellectual Property systems adopted should achieve: availability of a full range of PGRFA options for all growers at a local level; sufficient, safe, healthy, diverse and affordable food for all consumers; and sustainable livelihoods for all farmers. These objectives are achievable and are of vital concern to people throughout Europe and the rest of the world. European NGOs are willing to collaborate with the formal sector to achieve this agenda, but the formal sector must work at making this possible. 1. Patrick Mulvany is from the UK NGO the Intermediate Technology Development Group (ITDG) that was set up by E F (Fritz) Schumacher (of 'Small is Beautiful' fame) over 30 years ago to foster the protection and development of socially and environmentally friendly technologies (not least among these is the technology of the seed). His specialism in the ITDG and in various UK, European and International networks is in practical and policy work relating to the sustainable use of agricultural biodiversity. 2. Of particular relevance to the work of NGOs in Europe are the following GPA Priority Activities: Nos. 2, 3, 5, 11, 12, 13, 14, 16, 19 & 20. For a full description of these see the ICPPGR Web Pages.